lift-off carrying a Five-Man Crew who is set to deploy a Top-Secret spy satellite during their D.O.D. space mission. 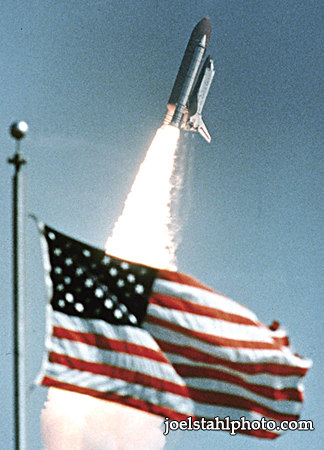 The distance between the flag and the launch pad is about 1-mile. 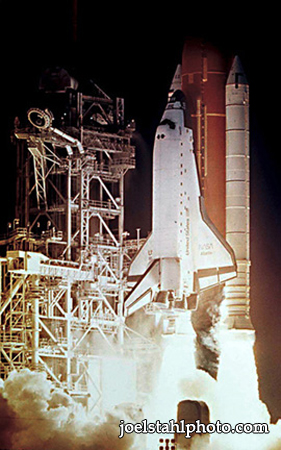 Flames from the solid rocket motors on the Space Shuttle Atlantis light up the launch pad as it thunders skyward into the night with a five-man crew on a secret D.O.D. mission at the Kennedy Space Center in Florida. 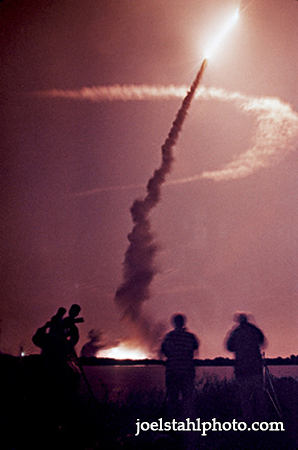 photographers at the press mound of the Kennedy Space Center in Florida during its 4am launch.